I have blogged about using narrative to measure changes in attitudes or to build up human sensor networks. These blogs have generated a lot of traffic. The use of narrative for better understanding social systems and social change is still a big interest of mine. This is why I have been digging a bit to better understand why narrative research is so powerful to understand change in complex systems such as communities. Imagine a spectrum of storytelling. At one end is Big ‘S’ Storytelling which includes those beautifully crafted stories we see in movies, novels, plays and even the latest Playstation games. Big ‘S’ Storytellers understand plot structures, character development, scene design and a myriad of other storytelling principles and practices. At the other end of the spectrum is Small ‘s’ Storytelling where we find the stories we tell on a daily basis in conversations, anecdotes, recounts and examples. Dave Snowden expands on these two categories and adds three more categories, among which he nestles the little ‘s’ – big ‘S’ spectrum. On the far left we have micro-narratives of day to day existence. These are the stories we tell as a part of day to day existence and can include photographs, voice etc. etc. They are fragmented in nature and they just happen. We then have reflective narrative which butts up against Shawn’s little “s” stories but is different. Reflective stories are the micro-narratives we recall when prompted by circumstance or question or those we create as mental rehearsal evaluate action. I have also added metaphor on the far right. Metaphor type stories such as the Children’s Party Story or Longitude take time to construct, lots of experimentation and refinement. They have a lot of detail that people often don’t discover or appreciate the value of until after multiple tellings. I find these distinctions really useful. Different types of narrative are useful in different situations. Also, we need to be aware of when we use the term ‘story’, as for many people a story is something fictional. for others a story, whether fictional or not, needs to be well-crafted, with a beginning, middle and end or following a specific pattern like the hero’s journey. Narratives can be much simpler. They can have the elements of a story, but they can as well be fragmented, partial, real, uninteresting, etc. Both Shawn and Dave add a second dimension to their discussion of narratives. Shawn talks about the story engagement and the ‘uncanny valley of business storytelling’ while Dave looks at the utility these different categories of narrative have aside from the context of their creation and also the distinction between resilience and robustness. You should had over to their blogs if that interests you (here and here). Knowledge management, in its normal use (not how it should be I hasten to add) involves recording experiences and codifying them for subsequent use. There has been a fair amount of narrative work here including NASA, Shell and others. In general journalists or other professions interviewed key staff and transcribed the stuff or preserved it on video. In both the cases I mention here I said at the time they would be a one year wonder and was proved right but more on that later. Story telling is as old as the hills, and in modern days we have seen the current generation of profession story tellers find a more profitable market in teaching executives how to tell better stories. Seminars and books abound many of which fall into the self-help and hyped sales bracket. But there are sound cases with festivals and other activities bringing together old practice with current need. I’ve taken part in a few and I think there is utility, but I am less sure on scalability. Research and Insight belongs in a long tradition of qualitative research. It ranges from the extreme post-modern anti-mangerialist approach of people like David Boje, to the more considered and reflective work of Yiannis Gabriel and Barbara Czarniawska. We have a range of methods for longitudinal research ranging from ethnographic techniques to detailed tagging of key words and concepts in tools such as NVivo along with a growing body of algorithmic methods of interpreting text such as sentiment analysis. Interesting is his remark about knowledge management and why he mentioned knowledge management in what he calls ‘its normal use’ but not ‘how it should be’. 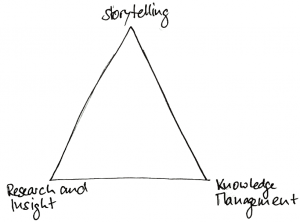 I want to follow this blog post with one or two that talk about the importance of narratives both in human collaboration but also in knowledge management and sensemaking. I hope that they will explain why Dave made this comment. This entry was posted in narrative and tagged dave snowden, knowledge management, narrative, shawn callahan, storytelling on 09/10/2017 by Marcus. Thanks Marcus or this introduction. Looking forward to read more about it. Thanks, Marcus. This provides a helpful frame. I look forward to continuing with the “Story” (whichever type!) in your next blogs. Thank you for this blog post Markus. I think you’re on an interesting lead with this synthesis. I too believe that the use of narratives has reached a stage where we need to refocus the discussion. There are drifts. I think there is room for further reflection on the use of narratives for the “appropriation and use of knowledge”part.